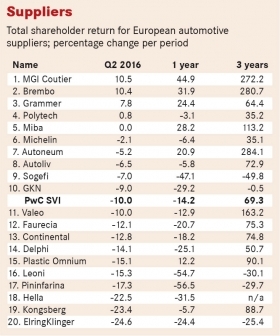 The values of Europe's automotive manufacturers, parts suppliers and retailers fell during the second quarter of this year, as measured by the Automotive News Europe/PricewaterhouseCoopers Transaction Services Shareholder Value Indices. 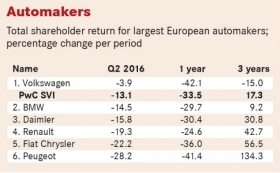 For the second quarter in a row, all of Europe's publicly traded vehicle manufacturers recorded declines in shareholder value. Automakers were down 13.1 percent following a 12.4 percent drop in the first three months of the year. The shareholder value of parts suppliers fell by 10 percent in Q2 while retailers slipped by 12 percent. The declines were much greater than those seen in European stock markets during the same period. So even though markets have been sharply affected by the UK’s decision to leave the EU, it is evident that the auto sector as a whole was on a downward trend of its own in advance of the referendum. Daimler, which in June confirmed joint venture plans for Mexico with Nissan, posted Q1 earnings and revenues in April slightly below investor expectations. It has also warned that profits will be affected by shrinking demand in North America and the Middle East for its trucks and because anticipated expenses related to Takata airbag recalls in the U.S. and Canada, estimated in February at about 340 million euros, are now expected to be higher. Peugeot has cautioned, too, that a sharp decline in demand for its cars in China offset buoyant first-half sales in Europe. In the U.S., Jeep Grand Cherokee owners have filed suit against Fiat Chrysler Automobiles, alleging the automaker concealed and failed to fix a shifter design defect linked to driverless rollaway accidents. Just four parts suppliers achieved gains in shareholder value in Q2, compared to seven in Q1. The two top performers were MGI Coutier, the French auto fluid transfer and mechanisms manufacturer, which was up 10.5 percent, and Brembo, up 10.4 percent. MGI Coutier posted Q1 revenue of 243 million euros against 210 million euros a year ago and confirmed its 2016 outlook of revenue above 900 million euros and current operating income ahead of last year. It also reaffirmed its target of achieving sales of 1 billion euros in 2018 with an operating profit of between 7 and 8 percent. Brake specialist Brembo once again performed well on the back of continued strong growth in North America. However, 10 suppliers recorded double-digit declines in shareholder value. The three weakest performers in the quarter were Hella (– 22.5 percent), Kongsberg (-23.4 percent) and ElringKlinger (– 24.6 percent). Norwegian company Kongsberg is currently going through a period of significant change following a shareholder revolt late last year. This has brought recent changes in the boardroom and among senior management, including the appointment of a new CEO and the resignation of its chief financial officer. Kongsberg says it is currently undertaking "a thorough review of its structural costs with the goal of sustainably improving operating margin." The share price of German suppler ElringKlinger, which recently acquired the assets of insolvent German tool and die making specialist Maier Formenbau, trended lower throughout Q2, having reached its highest level on March 31 since August 2015. 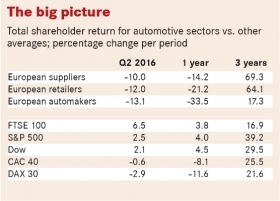 Among automotive retailers, Bilia and Stern Groep, which had single-digit losses in shareholder value during Q1, returned to positive territory in Q2. 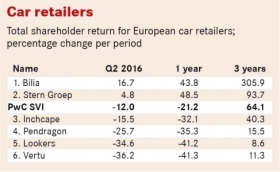 Bilia, Sweden's largest auto retailer, gained 16.7 percent and Stern Groep of the Netherlands was up 4.8 percent. The other four publicly traded European retailers, however, were hit by double-digit drops in shareholder value for the second consecutive quarter this year. The UK-based retailers were hit by investor concerns over Britain’s vote to leave the EU, the sustainability of UK economic growth and the cyclicality of the auto market. During the quarter Pendragon was down 25.7 percent, Lookers fell 34.6 percent and Vertu Motors slipped 36.2 percent. This does not reflect underlying performances. Vertu, for example, lifted its pre-tax profits by 17 percent to 27.4 billion pounds (32.7 billion euros) in its fiscal year that ended in February on a 17 percent growth in sales. But that did not prevent its shares ending the quarter with a value less than when they were listed a decade ago.